The idea for making Grilled Zucchini Summer Squash and Strozzapreti came to me when I peeked into vegetable drawer of the fridge and there they were . . .
. . .two squash waiting to be used. The main dish was going to be Grilled Shrimp with Lemon and Garlic and the shrimp was already in the fridge coated with the salt, baking soda and sugar spa treatment. Now I had to come up with a side that would compliment the lemony, garlicky taste of the shrimp. 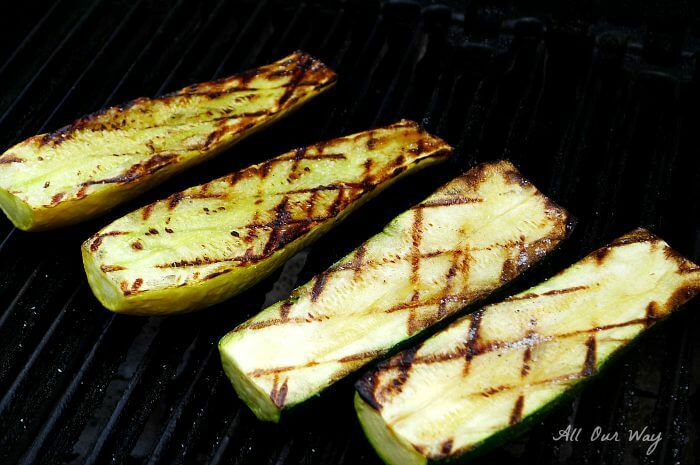 So, I thought, why not use the grill to make the grilled zucchini summer squash and have nice grill marks on the vegetables? Then I could make some pasta, make a lemony type of seasoning and we’d have a complete meal. As I looked through our inventory of pasta, I saw the tri-color Strozzapreti that we bought at Angelo’s. Angelo’s is a wonderful Italian deli/restaurant located in Venice, Florida. They have so many types of pasta that are imported from Italy. I can never decide which ones to buy. This pasta I figured would be perfect with the grilled zucchini summer squash since the red pasta is made with tomatoes and the green is made with spinach — extra veggies are always good. Once the zucchini and the summer squash were grilled it was so easy to toss all the ingredients together with the lemon vinaigrette. I made the lemon vinaigrette before I started the pasta. The shrimp took only a few minutes to grill and our dinner was ready to enjoy. Quick and easy recipes in the summer time are always a plus and when they turn out especially delicious it is a bonus! 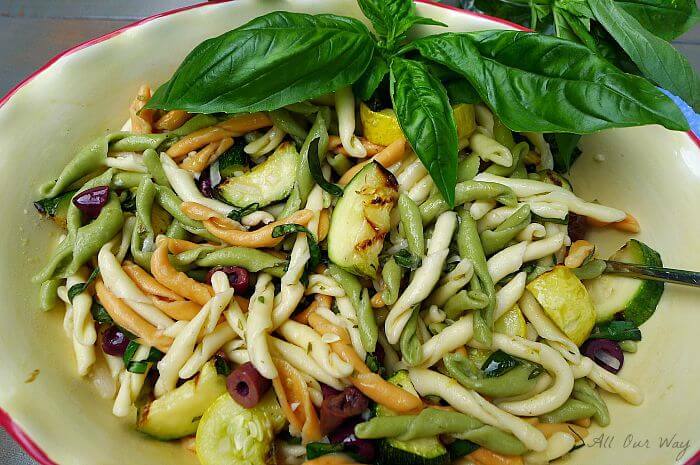 Grilled squash with Strozzapreti and tossed with a lemon vinaigrette. Can be served hot or cold. For the vinaigrette, whisk together the lemon juice, shallots, garlic, zest, thyme, oregano, and zest; salt and fresh cracked black pepper to taste. Preheat the outdoor grill to medium heat (350). Brush the halved squash with olive oil and place on grill. After a two or three minutes, give them on quarter turn so that they have nice grill marks. Turn over and do the other side. Once they are grilled cut them into half moon slices. Cook the pasta according to directions making sure it is al dente. Don't overcook -- it will absorb the vinaigrette. In a large serving bowl toss the Strozzapreti, zucchini, yellow summer squash, kalamata olives with the lemon vinaigrette. Taste to make sure if there is enough salt and pepper. Garnish with fresh basil. This dish can be served hot or cold. Oh. goodness!! This looks soooooo delicious . . . the shrimp, the pasta . . . the whole dish. YUM!! I’ve never had that kind of pasta, and it looks so pretty. 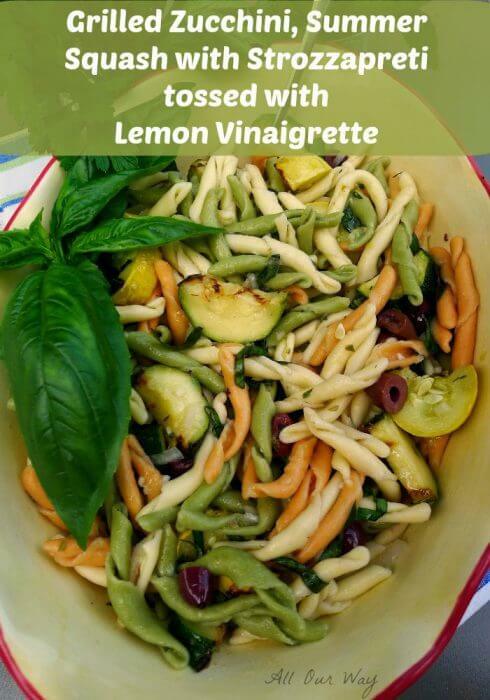 Lemon vinaigrette is so lovely on grilled vegetables and pasta. You nailed a perfect Summer meal, sweet friend! The recipe is really good, especially the shrimp. If you find the pasta — try it we really liked it. Hope your week is going well! OMG!!! This dinner was the BEST!! The shrimp was juicy, garlicky, and ohhhh soooo good! I promise you I will never make shrimp any other way! It’s quick, it’s easy, it’s wonderfully delicious!! The pasta was really great, too. A perfect accompaniment to the shrimp. 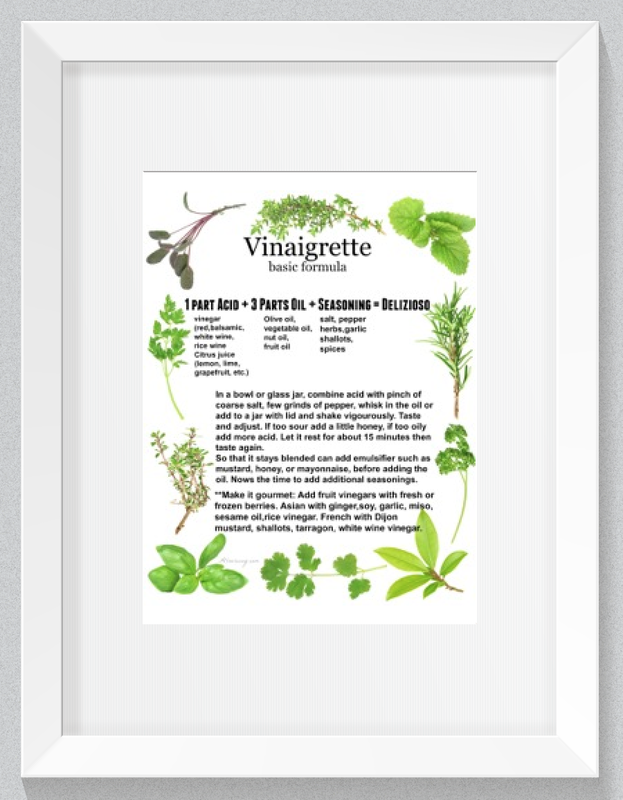 Just love that lemon vinaigrette! Can’t wait to try it on other things as well. Thank, you, thank you Marisa for a wonderful summer menu. Grazie, mia amica!! I’m glad you liked it. That’s the way I felt when I tasted it. Abbracci! 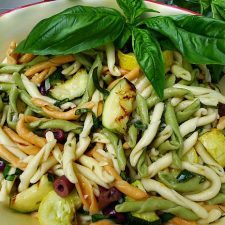 Hi Marisa, what a delicious looking recipe, I love grilled zucchini and it is so perfect with pasta. Will be trying this very soon. Thanks. I believe the best meals are created with what is in the refrigerator. I love adding zucchini to pasta, the zucchini tastes so much better. I also like that you grilled the squash. Great recipe Marisa. Yum! I will make this with your shrimp recipe over the week-end. I have a couple of small zucchini that I grew this year. I will use those. I am always on the look out for unusual pasta shapes, and I buy them and store them until I figure out how I want to use them. Home Goods is really good for having unusual imported pastas. I have two shelves full right now. Don’t know what I’ll use, but it will be good—it’s PASTA afterall!